The battle of the Atlantic 2013 starts on Saturday the 14th of December. The top five teams from the EU and NA summer playoffs will be attending. There are 5 best of three matches, with teams of equal ranking from each region facing off. This is the first time we will be seeing many of the teams after significant roster changes. The tournament will be played on patch 3.13, which was before any of the big changes that came in 3.14. However, Riot has said that they will be showcasing some of the new season 4 changes that we haven’t seen yet. Match will be played on Saturday between Dignitas (NA) and Alliance (EU). On sunday, we will see Team SoloMid (NA) and Lemondogs (EU). Over the next few days look for our what to watch for in these two matches, and our rundown of The following three matches will be coming next week. 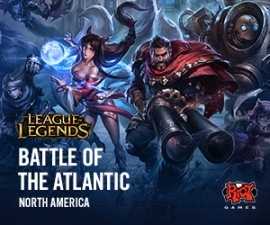 This entry was posted in News and tagged Battle of the Atlantic, Details, League of Legends Tournament, Match Rundowns, Short Preview by hablepwn. Bookmark the permalink.